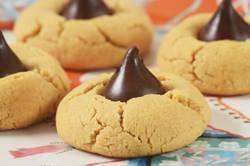 Peanut Blossom Cookies are a peanut butter cookie with a Hershey's Chocolate Kiss sitting happily on top. Some say these cookies resemble little hats and, in fact, Maida Heatter tells us in her excellent book "Maida Heatter's Cookies" that this recipe is an "old American recipe that is sometimes called Sombreros". Peanut Blossoms couldn't be more American; combining two of our favorites; peanut butter and Hershey's Kisses. Both have been with us since the early 1900s but how they exactly came together in this cookie, we do not know. The theory is that the recipe must have been invented by home economists in the Hershey's Test Kitchen. I did try to confirm this by going to Hershey's website, but while they do have a recipe for Peanut Blossoms, they give no clue as to their origin. While I was on their website I did find some interesting facts about Hershey's Kisses. These individually foil wrapped, bite sized chocolate Kisses were invented in 1907 and Hershey's tells us that "while it's not known exactly how KISSES got their name, it is a popular theory that the candy was named for the sound or motion of the chocolate being deposited during the manufacturing process". Today Hershey's makes 80 million Kisses each day and besides Milk Chocolate Kisses, there are Kisses with Almonds, Hugs Chocolates (used here), Kisses filled with Caramel, Kisses filled with Peanut Butter, and even Kisses filled with Chocolate Truffle. When making these cookies, the unwrapped Kisses are placed on top of the peanut butter cookies immediately after baking. Be sure to press the Kiss gently but firmly into each cookie just until you see the cookie start to crack. That way the Kiss will stand upright. These are great anytime of the year and I do not know who enjoys them more, kids or adults. Peanut butter is a smooth paste made from roasted peanuts. The peanuts are ground, and then salt, a sweetener, and sometimes a stabilizer (to keep the oil from separating) are added. There are two types of peanut butter, and the one that is labeled "Old-Fashioned" or "Natural" does not contain a stabilizer which means the peanut butter will separate and you will have to stir the peanut butter before using. Peanut Blossom Cookies: Line three baking sheets with parchment paper. In the bowl of your electric mixer (or with a hand mixer), beat the butter until creamy and smooth. Add the peanut butter and sugars and beat until light and fluffy (about 2 - 3 minutes). Add the egg and vanilla extract and beat to combine. Beat in the milk. In a separate bowl whisk together the flour, baking soda, and salt. Add to the peanut butter mixture and beat until incorporated. Cover and chill the batter for about an hour, or until firm enough to roll into balls. Roll the batter into 1 inch (2.5) round balls. Place the granulated white sugar in a shallow bowl and roll each ball in the sugar. Place on the prepared baking sheet, spacing about 2 inches (5 cm) apart. Bake the cookies for about 8 - 10 minutes, or until the cookies are lightly browned. Immediately upon removing the cookies from the oven, place a unwrapped Chocolate Kiss into the center of each cookie, pressing down gently until the cookie just starts to crack. Cool completely on a wire rack. Heatter, Maida. Maida Heatter's Cookies. Cader Books. New York: 1997. King Arthur Flour. The King Arthur Flour Cookie Companion. The Countryman Press. Woodstock: 2004.